Knowledge is limited about prognostic significance of breast cancer subtypes among women with small invasive node-negative breast tumours. We explored patterns of recurrence in 1691 women with pT1mic/T1a/T1b, pN0 and M0 breast cancer according to four immunohistochemically defined tumour subtypes: (i) Luminal A (ER-positive, PgR-positive, HER2-negative and Ki-67 < 14%); (ii) Luminal B (ER-positive and/or PgR-positive, HER2-positive and/or Ki-67 ≥ 14%); (iii) HER2-positive, both endocrine receptors absent; and (iv) Triple Negative. At multivariate analysis, women with the Triple Negative breast cancer subtype had an increased risk of loco-regional relapse (LRR) (Hazards Ratio (HR) 3.58; 95%CI: 1.40–9.13) and breast cancer related events (HR 2.18; 95%CI: 1.04–4.57). 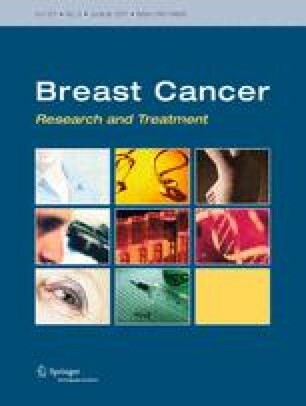 Overall, Luminal B subtype was not associated with a statistically significant increased risk of recurrence compared with Luminal A, while patients with Luminal B subtype tumours overexpressing HER2 had a 2 fold risk of reduced breast cancer related survival (BCS), but not an increased risk of LRR and distant metastases. Women with HER2 breast cancer subtype had a statistically significant increased risk of LRR (HR 4.53; 95%CI: 1.56–13.1), distant metastases and reduced BCS (HR 3.22; 95%CI: 1.44–7.18) and overall survival (HR 2.87; 95%CI: 1.05–7.89) when compared with the Luminal A subtype, at multivariate analysis. In conclusion, women with small size, node-negative, breast cancer are at higher risk of relapse if with HER2-positive endocrine receptor absent or Triple Negative disease. The online version of this article (doi: 10.1007/s10549-011-1465-7) contains supplementary material, which is available to authorized users.